While in Long Beach, California, for the recent National Needleart Association trade show, I discovered a gem of a boutique next to our gem of a hotel: a $1 bookstore on Pine Avenue. 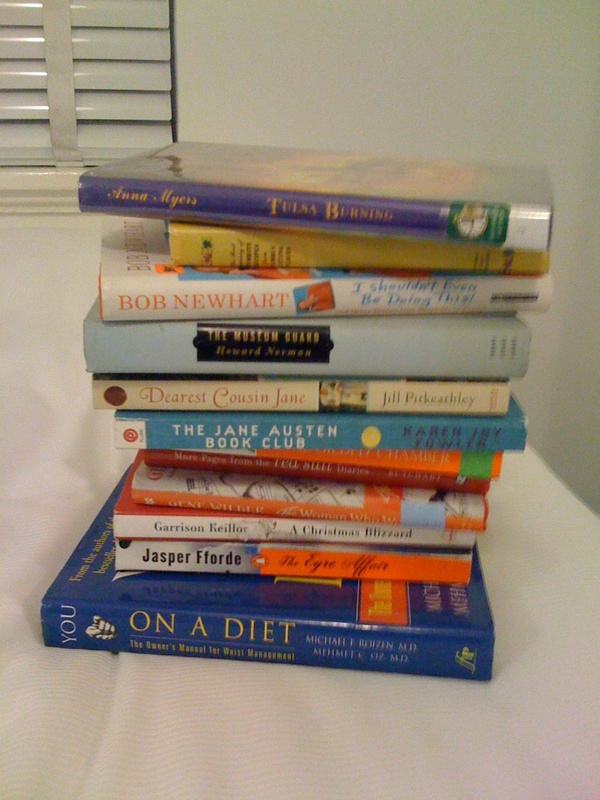 All books (all used books, but bestsellers, vintage, classics, and fluff in good shape) were just $1 each. I spent $12 and hauled home a carry-on bag full of treasures. Then last weekend, my sister and I trekked to the Book Thing of Baltimore, a free book warehouse. I have always been a fan of reading, and now I have A Year In Books planned out, along with a keepsake bookmark chosen for each tome. (Do you coordinate a bookmark with a book's theme too? Pick a special one for historical fiction, and another bookmark design for true crime... Of course bookmarks have "personalities," right?). The stitchery on the wall in my foyer says "Welcome." In my kitchen: "The Early Bird Gets the Worm." Next to my window: "Le Jardin." My back door: "Peace." Do you write your words in stitches? Or have you stitched someone else's words that inspire you or make you laugh? You are part of a long tradition of self-expression. Keep stitching and, better yet, stitch some words for someone else. Be a global ambassador of The Right Words that will resonate with someone and help their daily challenges. Here is one idea: we are heading into the 2011 Stitching For Literacy Bookmark Challenge, a world-wide campaign to share stitched bookmarks and promote literacy programs. Simply stitch the word "Read" or a quote from a book and donate it to the challenge. It is quick and easy and fun and meaningful. Let's get started stitching and helping others learn to read. On my word...."Go!" "Your company is out of the box," someone told us at the recent TNNA needlework trade show for needlework businesses, designers, retailers, and teachers. "You just don't fit in a box!" We took that as a compliment. It is true that Kreinik threads can be used in all techniques, can be used as is or modified to create new effects, and can be used in ways we've never even considered. It is the creative thinkers of the world that inspire us as thread makers. A wired Kreinik thread has been requested by some of those creative thinkers for at least 15 years. Some innovators on their own inserted wire into our heavier braids to create dimensional effects (and still do), but they kept asking us to make a wired thread, year after year. We played around with it, but since we manufacture our own threads in our West Virginia factory, we couldn't get the production down to a good process. When DMC came out with their wired thread last year, the requests really amped up. Back to the drawing board—and machines—and we figured it out. We are so excited to debut nine colors in a wired Kreinik metallic we call "Wired Braid." Judging from the positive response at the show, this thread is going to be another valuable tool to bring your creative ideas to life through color, texture and dimension no matter what medium or technique you use. "I'd make Valentines!!!!! Id mix it up, id cross stitch, embroider, outline!" - Amy K.
"I'd use wired braid to embellish cross stitch projects, greeting cards, frame photos, so many ideas --- so little time!" - Doris D.
"Soooooo many ideas! Create shapes to dangle from mobiles, stumpwork foundations, jewelry..." - Karen C.
"Definitely the invites I'd be sending out for all the birthdays coming up over here!" - Amanda R.
"I would use it for my fiber art for 3D additions to the pieces. Also I could see incorporating it into some of the coiled wire items I create" - Barb B. "I need to make a cork screw for one of my needlepoint projects. This looks like it would do the trick!" - Carol V.
"I have a couple of WIP's that could really benefit from sparkly definition...and one in particular that I wanted to add a word to and this wire would be just spectacular!!!" - Lisa L.
"I would use it for the wings of my beaded angels. Definitely use it for mystical cross stitch outlining/couching." - Rowie M.
"I would use it to embellish my cross-stitching and other needlework projects." - Kim R.
If you are couching Wired Braid™ onto your needlework, there are a few handy tips. As with any thick thread that you couch, we recommend that you tape the ends to make it easier to plunge to the back of your work. As Sue Jennings recommended, "Make the tape pointy and the end will act just like a needle." 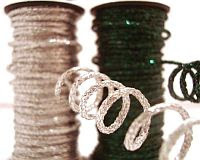 Then couch it with a coordinating color of thin Kreinik Blending Filament, Cord, or Very Fine #4 Braid, or use a clear monofilament sewing thread. Look for the new wired metallic braid in needlework stores (Hot-Wire colors carry a "W" after the color number). Look for it to "pop up" (pun intended) in designs and stitch guides coming out this year. Visit http://www.kreinik.com/shops/Wired-Braid.html for a color chart and more information. And most of all: have fun with this new dimensional embellishment thread. Doug Kreinik Makes Acting Debut! We all know Doug is a fine lecturer, salesman and thread maker...but an actor? 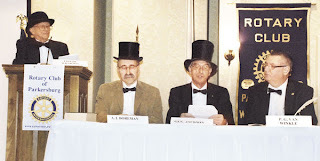 Read about the multi-talented Doug Kreinik in his acting debut for his local Rotary Club. Click here to read the article about it in the News & Sentinel. Doug is 2nd from the left.